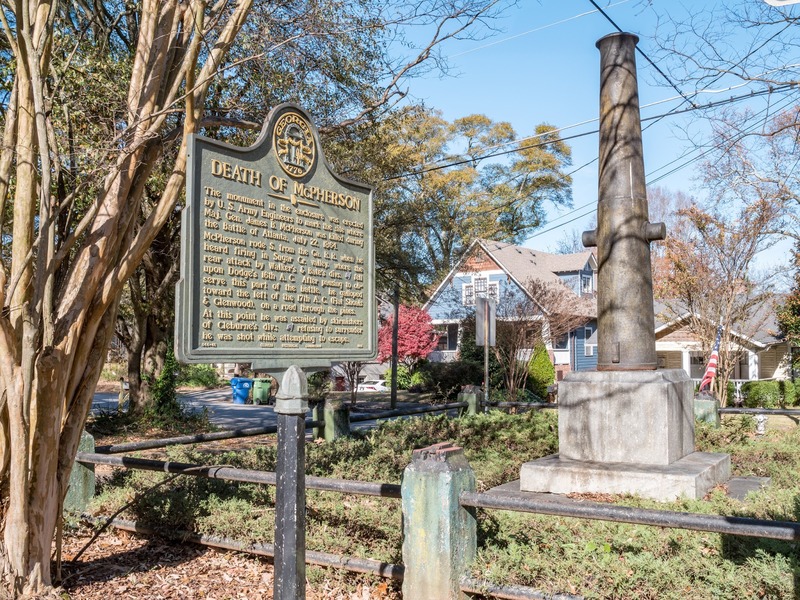 Without a doubt, the “Death of McPherson” monument in East Atlanta has to be the most unexpected Civil War memorial to be found in the entire city. First, it's not located in a large public space or on a notable battlefield, although, truth be told, all of Atlanta was a battlefield when Sherman's Union forces encountered the city's Confederate defenders in the summer of 1864. Instead, the monument occupies a small enclosure at the intersection of McPherson Monument Avenues, nestled in an unassuming neighborhood shorn decades ago from the rest of the city on its northern side by the unforgiving concrete knife of Interstate 20. What is also surprising is that, unlike the myriad of other plaques and statues which commemorate famous battles or once-revered Confederate leaders in this region, this one memorializes the death of James B. McPherson, a Union general who was killed only a few blocks from the site while attempting to escape capture by rebel "skirmishers." McPherson was the second highest ranking Union officer to die in combat in the Civil War. His young age at the time of his death, 35 years, is a reminder that wars fought at the level of ferocity of the American Civil War quickly become pitiless, but efficient, meritocracies. But how is it that a Yankee general came to have a monument erected in his memory so deep in the heart of Dixie? It is utterly inconceivable that a memorial like this one would have been undertaken by the citizens of Atlanta at any point in time during the hundred years or so following the conflict which some Southerns called the War of Northern Aggression. It turns out that the authors of “Death of McPherson” were none other than U.S. Army engineers. They erected the monument in 1877, shortly before all Federal troops were withdrawn from the South as part of the deal struck by the incoming Rutherford B. Hayes administration to bring an end to the fraught period in this country's history known as Reconstruction. Although little discussed today, Reconstruction was a failed attempt to bring about genuine political transformation in the vanquished states of the Confederacy. Equal protection under the law and universal enfranchisement (of men), promises of the Fourteenth and Fifteenth Amendments to the Constitution, went unfulfilled. And that “special institution,” slavery, abolished in name by the Thirteenth, was soon exchanged for the apartheid regime that came to be known as Jim Crow. A dozen years after the end of hostilities, little about the political facts on the ground had changed. As late as the the election of 1876, hundreds of black men were being massacred while trying to exercise their right to vote as members of the Republican Party. It is a sad irony of history that it is this same Party of Lincoln now pursues the suppression of the African-American vote in the states of the former Confederacy with the imposition of unjustifiable voter identification laws. So, in a premonition of the futility of military occupations to come, the U.S. government gave up on its plans for “regime change” in the South. Instead, in order to extricate itself from an open-ended, bloody mess, the Hayes administration declared Reconstruction over based upon the scant facts that slavery had been eliminated and the Union restored. But what also makes the monument to McPherson unexpected is its design: a bare cannon barrel elevated skyward, with its short trunnions projecting to either side suggesting, perhaps, a meager cross, but a very meager one, if that. That it is a brazenly phallic goes without saying. Maybe there is some subtle war memorial iconography at work here, but I doubt it. With the dispiriting circumstances of Reconstruction in mind, it's hard not to imagine “Death of McPherson” wasn't intended to be a defiant farewell by departing officers of the U.S. Army to Atlanta and the South, a profane gesture marking the end of a hopeful project to transform the world that ended only in more spilled blood and profound disillusionment.